Always Prepared. Like a Boy Scout. But Not. This is the first post in a series of posts about how I did something dumb and how you can avoid that dumb thing. Except that I’m ADD and forgetful, so it might just be 1 stand alone post that leaves you wanting more. Hi, Its been awhile. If you’re new to SaraEllenAwesome, stay awhile and look around. If you know me, you already know I’m weird, if you don’t…well now you do. Give Blood (to legitimate places, don’t just give it to strangers). It helps people. It’s not hard. It doesn’t take long and they give you cookies and juice. But I want you to listen to the rules they give you after you give that blood. Also, I want you to remember that you gave blood. Because if you get busy in the kitchen that night and forget you gave blood, especially if you’re already slightly iron deficient anemic, and you pour a glass of wine, you just might pass out in the shower. Or almost pass out in the shower. This warning is not based on a true story, it IS a true story. My true story. And that one single stupid glass of wine caused me about 36 hours of recovery time. While standing in the kitchen for a couple hours making lunches for us for the week, I decided hey, I might as well have a little glass of wine. Little did I know that would be my downfall that day. After the glass, I decided to do 85 squats and take a shower. That’s when things when downhill, fast. Pretty much immediately, I had to have the hubs come help me. He brought me cold water and I asked him to stay near so he could hear me if I yelled while I tried to really supersonic fast finish my shower. I made it through washing my face before I ended up sitting on the floor of the shower, within seconds of passing out. When I finally made it out I put on a robe and laid on the bathroom floor until I felt like I could move enough to make it to the bed. I’m 28 years old and my husband had to actually help me get dressed. BECAUSE I DRANK A GLASS OF WINE. I mean, come on, Sara, how dumb can you be? They told you not to drink. It’s not like you drink on a regular basis either. You were bored and thought Hey, a glass of wine, you seem nice. NO. It was not nice. Also, don’t do a big workout after you give blood either. Did that once before, too and I ended up teaching my kickboxing class from a seated position for some of the time. It’s not worth it. Giving blood is worth it, but make sure that’s all you do the rest of the day. Milk it. Prop your feet up and watch a marathon of whatever you love to watch and make your husband feed you grapes and wave palm leaves or whatever. Just whatever you do, DON’T break the “after you give blood” rules. That was your P.S.A. for the day 🙂 You’re welcome. ok, so that’s not true, but it did get your attention and it did get you to click on my blog but now you just think I’m a liar so I better have something awesome to follow this up. Right? Well..lucky you I have no idea what I’m going to write about now. Maybe how my brand new coworker said to me “I still haven’t decided if you’re a serial killer or not” and I had only been there 5 days. I have no idea why he would say something like that to me. I mean I’m a nice person, with morals.. I can’t remember how we got on this subject but he said something like “if you tried to kill me you would fail because I would take your knife and stab you with it” and I said, I wouldn’t use a knife. So he said ok, I would take your gun. And I said I wouldn’t use a gun, there’s too much evidence. And then I just sat there and looked at him while he tried to figure out what I would do…then he said “you would slowly poison my coffee, wouldn’t you?” And then I just laughed and looked away. And then today someone told him I was a kickboxer so he better be nice, and he said I wasn’t scary and another coworker said well she’s probably faster than you, I wouldn’t mess around. All the while I was just sitting there listening. See, I don’t even need to talk and people just know that I’m not one to be messed with. Even though I have literally never been in a fight. Except that one time where my step brother punched me in the throat. But that was the beginning and the end of that fight. I was leaving church and there was a frog in the exit of the parking lot. I tried to go over it where it was in the middle of my car but I’m pretty sure when my front tires passed it, it jumped and my back tire got him. I got out to check on him after I passed him and he was smashed. By me! I killed him!! He probably had a family. He was just hopping along being all froggy and here I came, a big giant murderer and ended it for him. Don’t they say that we create the future that’s predicted? Like when people predict trouble in the stock market, people start selling their stocks which basically causes the crash they predicted? What if all this Zombie talk has scientists in their labs trying to create zombies? I know there’s that flower that makes zombie ants, so I bet there are scientists out there trying to replicate it in rats or something. I think we should all keep an eye on the local rats to make sure they aren’t running around all dead and stuff. I’m sure they’ll say they’re trying to come up with possibilities for how they’ll be created so they can cure the zombie disease when it actually happens. But that’s not true…Did they not learn from Frankenstein? Science CAN go wrong, and it CAN become something you can’t control. I hope the government has some sanctions on zombie creating…in fact, if the military is having zombie training exercises then I bet they already know the hows and the whens of the upcoming zombie apocalypse. The government is sneaky like that. Guess I should get some zombie bullets, and some various weaponry in case of an outbreak. I read that the safest place to go would be a military base so perhaps I’ll do that….I hope they have twinkies…wait…nevermind. Maybe they will make a vaccine you can get to prevent you from getting the zombie bug…like the flu shot. But if it works anything like the flu shot they have now, then the vaccine will just cause the zombie apocalypse because I’m pretty sure the vaccine for the flu causes the darn flu. I’m sort of anti flu shot, if you haven’t guessed. I just googled Zombie Rats and found that they do exist….are you kidding me, science?? Usually when someone is going to take you, they’ll cover your mouth with their hands, or put a gag in your mouth to keep you quiet. But ventriloquists can be just as loud with their mouth closed as I can be with my mouth open. They can even articulate words and sentences without moving their mouth, so I bet it’s pretty hard to kidnap a ventriloquists and keep them quiet. They could even yell in different voices to make people who could hear think there are several people being held hostage so they’ll speed up the rescue process. They could probably even throw their voice to sound like cops are outside threatening the kidnapper. They could yell things like “we’ve got you surrounded” “release the hostage and all your requests will be met”, you know, things like that. I should probably start working on my ventriloquists skills just to ensure my safety. I thought the weird people in California were in the major cities, but apparently I was mistaken. Santa Barbara has interesting people, too. It’s a beautiful city, and when I’m walking near the beach I should have been paying attention to the beautiful ocean and the shops, and the artists along the street, but no, I was distracted by the man with the tail in front of me. He looks like a perfectly normal dude walking down the street until you pan down towards the ground and see the tail. Why? Why does he have a tail? I should have pulled it to see if it was real. I wonder what he would have done…would he hit me? Yell at me? Scratch me with his hidden squirrel hands? 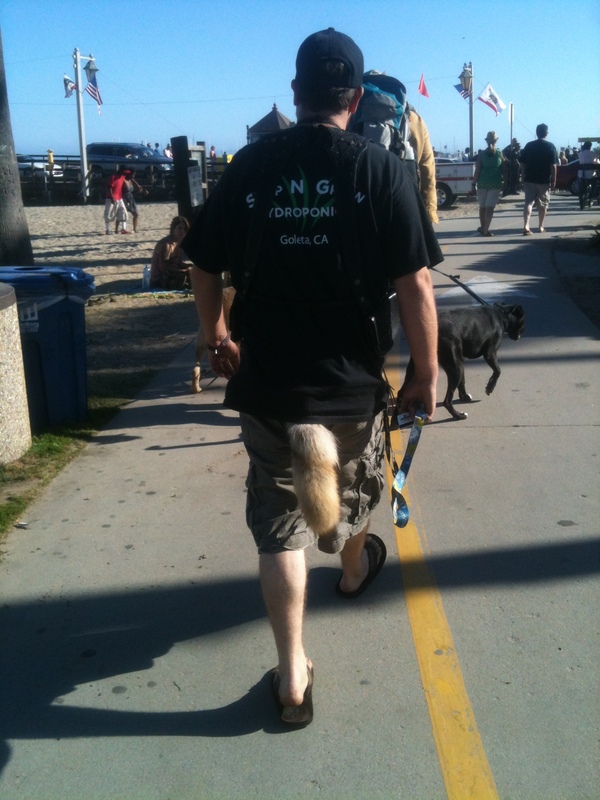 Maybe he should be on the My Strange Addiction show…maybe it’s deeper than just the tail. It’s not like it was a full moon or anything, it was the middle of the afternoon. Yes I know I’m posting this in October, near Halloween, but this picture was taken in August so you can’t argue that he was just dressing up for the holiday. When I recently wrote about how badly I want a kitten, I really didn’t think Chris took my kitten threat seriously. However, yesterday he told me that he has stress because every day when he comes home he doesn’t know if there is going to be a kitten here. I am not really sure where or how this came up in our conversation over dinner, but it did and it was wonderful. It’s good to have something in your life to keep you on your toes. I’m home alone all day, so it is fully possible that I will find a kitten on my lunchtime run, or maybe I’ll be buying dog food at the pet store and they’ll be having a kitten sale. I actually found a kitten when we were on vacation in California a few days ago. I was mid conversation in the kitchen with a couple family members, and I saw this little black and white ball of adorable walk across the sitting area outside and I said Ohhh Kitten, and walked outside. I fully expected the cat to run from me because they usually do, but this one meowed a sad little sound and let me play with it! It was so cute and sweet and you could tell that it recently had a human family because you could see the indentation in it’s fur from a collar. I would pet it, and it would roll back on it’s back and play with me and even today I am reminded of my little furry friend when I look at the scratches all over my hand. Cats are fiesty like that. They’re like oh I love you, pet me but don’t get to comfortable, remember I have sharp claws, see? I told Chris I needed to find a way to smuggle it on the airplane. I could just zip it up in my giant purse and be like shhhh kitty, just stay here under the seat, we’ll be home soon. And then we would live happily every after. I mean, I doubt he would kill a kitten. After my wonderful cat, Otis, ran away to live some wonderful, fancy life with his cat friends (at least that’s what I tell myself happened to him) I was kind of OK with only having dogs for awhile. I was about to get married, and move away and I knew that our future land lord would prefer if his new tenants only came with two dogs and that the move would be easier with just two animals. However, lately I have been really wanting a snuggly little kitten. One I can let sleep on my head, and purr in my ear. So I decided to broach the subject with Chris. Me: When we own our own home, I will be more persistent. That was the end of that conversation, but I was not kidding about being more persistent/annoying about it in the future. However, I started thinking (dangerous ground, I know) if I got a kitten…an ADORABLE, AWESOME kitten, what’s he going to do about it? Sure, he’ll be mad and he might try to convince Max it’s a chew toy, but seriously, he’s not going to leave me or kill the kitten. He would just have to deal with the new addition to our family. He would fall in love with that kitten, he just doesn’t know it yet. That cat will become his best friend. That’s probably what he’s afraid of. He’s afraid he will love that kitten so much that he won’t have any more room in his heart for me. But it’s ok honey, I know that a cute kitten can steal your heart and I won’t take offense. He hasn’t been around cats enough to know that they can be really freakin’ awesome creatures. If they weren’t, there wouldn’t be an LOLCats website with tons of funny cat pictures. Cat’s are awesome and if you don’t realize that, then you yourself are not awesome. Anyway, I’m going to get a kitten and I’m going to hide it in the house, and when Chris finds it, I will just tell him it’s an odd looking dog with a strange sounding bark that I inherited from a relative I didn’t know I had, but I have to keep it because it’s family. Come Back! I just want to save you! Why is it that everytime I see a stray dog I can’t find it when I go back to save it? Seriously, I just want to help them and they either run away from me or disappear. Last time I was in Dallas, I was driving home from work and saw a really sickly, starving puppy on the side of the highway. It was so close to the busy road, I wanted to get it in my car and take it to a shelter or wait with it until someone could come get it. I had just been to the store to get dog food for my dog, so I had it in the car and was going to feed the puppy. So, I circle around, but it takes awhile because it’s 2 highways intersecting, so it’s complicated getting back around. By the time I get there, the puppy is laying in the big grassy area between the highway and the service road. So I pull over, and get out of the car. Immediately the puppy gets up and I think yay! he’s going to come to me! But no, he runs away. He wants no part of the rescuing and it breaks my heart. So I find the number to animal control and of course they make it so complicated to report an animal, and one of the questions they ask is “is it a pitbull?” What the heck, I don’t know (but I think it was). If he is a pitbull, are you just going to let him die out here? Why does that matter? Then the lady says well, the repsonse time on something like this is 3 days. 3 DAYS? Completely ridiculous. Today, I drove out of my street and saw 2 dogs coming out a nearby neighborhood. They looked well taken care of but didn’t have a collar. I was heading to the fitness center in the neighborhood, so I pulled into the parking lot to google the animal control people but I realized that the visitor center was right by me and they should have important phone #’s so I went over there. First thing the lady says is, well, you can put a posting on our neighborhood website that you found these dogs, but I don’t know how soon anyone would see that…Totally not helpful lady. Seriously? It’s going to be 95 degrees today. Then she gives me the animal control number. It’s been maybe 5 minutes since I saw the dogs so I decide to go look for them as I call animal control. I described the dogs and hopefully they’ll find them. And hopefully they’ll be chipped so their owner can be found. Anyway, I can’t find the dogs anywhere. I drove all over the close neighborhoods looking for them and they were nowhere. There was a school right near where I last saw them so hopefully they just went to play with the kids. That’s what I’ll believe. I should have just picked them up the minute I saw them and THEN tried to call the animal people. Lesson learned. I also like to rescue turtles that try to cross the street but haven’t quite made it. The first one I saw was on his back next to the curb, so we pulled over, I got out and put the turtle in the grass. The second one I saw was walking across the road, so we stopped so I could hop out and carry it to the grass. As soon as I got out and put my hands on the turtle shell it turned toward me and started running at me and towards the middle of the road. Of course I shrieked and jumped and then I felt stupid because it’s a turtle, they’re totally not frightening creatures. So I tried to get the turtle again but contrary to common belief, that turtle was FAST and cars were starting to come down the road and we didn’t want to cause a traffic jam, so I just got back in the truck, and gave up because clearly the turtle wanted to be in the street. It was probably suicidal and didn’t appreaciate my help which is why he tried to chase me. I did notice as we pulled away that another car was stopping to try to help the turtle. I wonder if the turtle tried to attack them, too. One more, but this doesn’t really count because it’s a plant and not something that can run away from me. A few days ago I saw a flowery plant laying on the side of the road in my neighborhood, and it looked like it had just been plucked out of the ground, so I continue to drive about 10 feet, and I see a hole in the middle of the landscaped area where that plant clearly came from. So I pull over, get the plant and re-plant it where it went. I don’t know why I feel the need to do things like this, but I didn’t like the idea that the plant had just been pulled out of the ground, and was left there to die. Our neighborhood landscape is pretty and I want to keep it that way. So anyway, I drove past it the next day, and that plant was laid over all wilted. Oh well, at least I tried. Posted in just life, people do weird things, things that shouldn't be difficult but they are because they're stupid. When someone in your life passes on, it makes you think about life and death and what type of impact you’re making on the people in your life. It makes you think of how people will speak of you when your time comes. It makes you wonder how you are being viewed by the people around you. I want to make an impression on the people in my life. I want to be known as someone who had a great deal of patience with others, was kind-hearted and was a spot of sunshine in the lives of those I’ve encountered. I want to be an inspiration to others, and show that having a heart full of Christ is awesome and changes life (and death) for the better. I also want to be remembered for being funny and finding the humor in all things. When this life of mine is no more, I want to be positioned in the casket with my right hand up so everyone that comes up can give me high-five. When people walk past my body at the end of the funeral, they will want to cry because I’m sure life without me in it will be unbearable, but then they will be like, Oh she’s giving me a high-five. That’s cool. And they’ll laugh and think “that Sara, always makin’ me laugh, she’s so ridiculous”. And then they’ll tell Chris that I was probably joking when I said I want to be in the casket with my hand up for high-five’s but it’s ok, because it WAS pretty funny and I’m probably laughing from heaven, telling Jesus that I just got 500 people to high-five my dead body. Yes, 500 people will miss me enough to come to my funeral. If only 50 people show up, then my family needs to go out and find 450 more people and bring them along to mourn me. I mean high five me. Subscribe! Come on, do it!